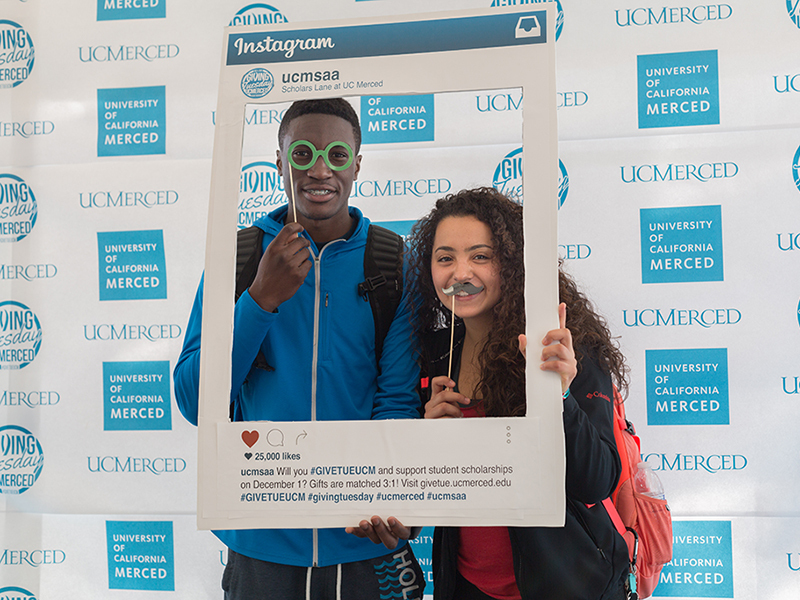 UC Merced employees and alumni were loud and proud supporters of the #GiveTueUCM campaign, part of the international day of charity known as Giving Tuesday on Dec. 1. Including matching funds, the university raised more than $310,000 for undergraduate scholarships and $316,000 total. Last year’s inaugural effort raised just over $40,000. Almost 400 individual donors participated in this year’s campaign. Of those donors, 102 were UC Merced alumni and 132 were either staff or faculty. “It’s the highest number of individual donations we’ve ever received on a single day,” said Chris Abrescy, alumni relations director and a member of the campaign’s steering committee. The 3-to-1 match, offered by Wells Fargo and Foster Poultry Farms, quadrupled gifts directed to 12 scholarship funds during the 24-hour #GiveTueUCM campaign. The first two gifts of the campaign came from Chancellor Dorothy Leland and Vice Chancellor for Development and Alumni Relations Kyle Hoffman. About 24 hours later, alumna Danielle Armedilla (2012), who works in the Office of the Chancellor, made the final online gift. The San Joaquin Valley UC Alumni Scholarship Endowment received $36,440 post-match — the most of all eligible funds — and reached its endowment goal. An endowment is a legacy gift that generates interest to maximize its impact over time. Endowments are not always immediately accessible, as it can take time to reach the minimum level required. The school scholarship funds, on the other hand, are immediately awarded the following term at the discretion of the deans. The School of Natural Sciences raised almost $22,000 for its undergraduate scholarship fund after the match. The School of Engineering raised about $9,500, and the School of Social Sciences, Humanities and Arts raised almost $12,300. School of Natural Sciences Dean Juan Meza was a vocal advocate of the campaign, challenging his staff, faculty, students, alumni — and even his fellow deans — to support the initiative throughout the 24-hour period. The first in his family to attend college, Meza knows firsthand the impact scholarships make on the students who receive them. When Meza talks about what drives him to personally support scholarships and encourage others to do the same, he echoes the sentiment shared on social media by other employees who participated in the campaign. The passion of donors was evident by the choices made in targeting funds. The Guardian Scholars Scholarship Fund, which supports former foster youth enrolled at UC Merced, received more than $31,000. The Dream Act Scholarship Fund received more than $29,000. That fund supports students covered by AB 540, which allows undocumented students who graduate from California high schools to enroll at public universities. Those students are not eligible for federal financial aid. Drs. Jose Miramontes and Julia Villa-Miramontes, parents of 2015 graduate Jose Miramontes, donated $5,000 to the Dream Act Scholarship. Jessica “JaeJae” Julian (2009) and Marko Zivanovic (2014) became the first alumni to create scholarship endowments by pledging to give $10,000 each over the next five years. Upon fulfillment of their pledges, the matching funds will turn their donations into two $40,000 endowments. Though #GiveTueUCM attracted a number of large gifts, Abrescy said the appeal of the campaign was that the matching funds made no gift seem too small. A total of 82 current students gave 85 individual gifts online and in person. “A $5 pledge was multiplied to $20, and we had a lot of students show up at our Lantern headquarters to donate anywhere from $1 to $20 toward their school scholarships,” he said, noting that the largest student gift was $180. After the match, contributions from current students totaled more than $5,100.